Many years before Honda built their now legendary Accord-based four-slamming-door high-roof miniature van, the Odyssey name was used by Honda’s Powersports division for a minimalist single-seat off-road go-kart. 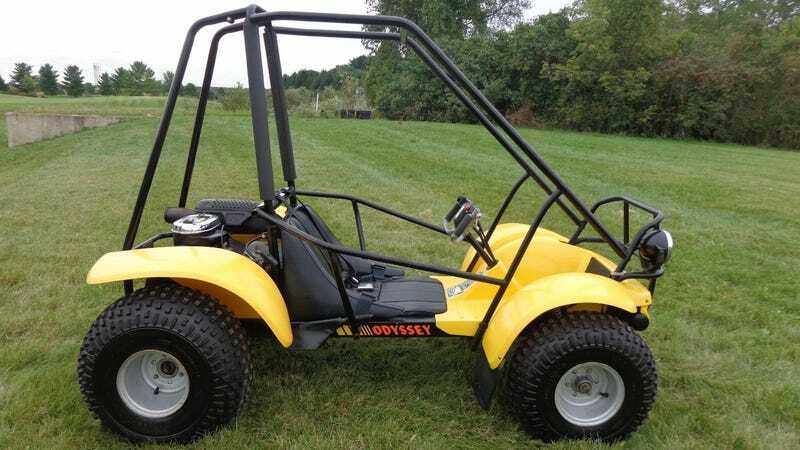 It weighed just under 400 pounds, and used a 250cc two-stroke ripper of an engine for personal off-road mobility. With 5.5-inches of ground clearance, a solid stick rear axle, and front trailing arms, it’s hardly imbued with the most sophisticated off-road equipment, but it’s small and nimble and light weight, has nearly infinite angle of approach and departure, and could climb a 35-degree incline with ease. It’s effectively little more than an engine, four wheels, and a rinky-dink roll bar surrounding your meat suit. The later FL350 model had a wider track for better stability and a larger engine for more power, but I prefer the pure and simple approach of this first-year 1977 Odyssey FL250. The early models are differentiated by yellow bodywork where the later examples moved to the now-tradition Honda Red. I’ve never seen an Odyssey in person as clean as the one shown here appears to be. You can find more photos and information about this machine by visiting the eBay listing. It’s the kind of thing that you can have a blast ripping around the back-forty every other weekend. With the popularity of off-road side-by-sides, it might be time for Honda to bring back the single-seat two-stroke Odyssey.